The restaurant’s cuisine is based on two types of food: meat and fish. We needed to create a minimalist interior that would explore the subject of meat and fish in an unconventional way, and would keep the emphasis on food and cooking techniques. 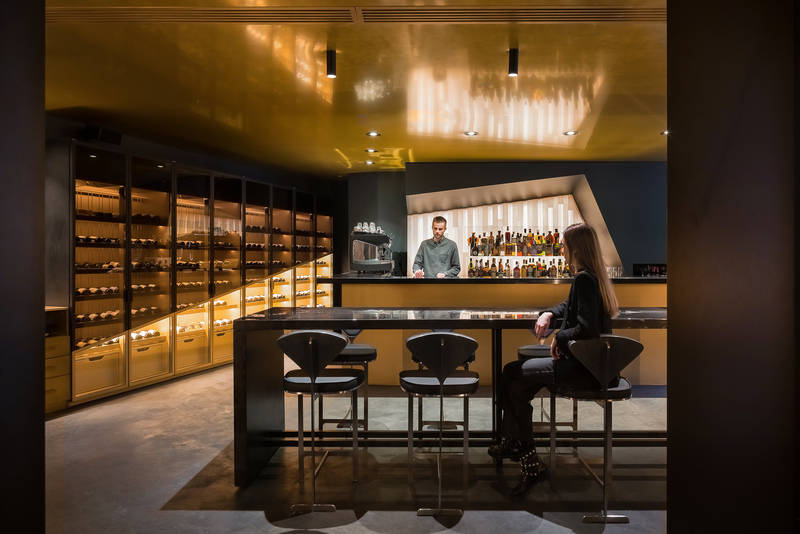 To find a balance between a minimalist hi-tech interior and the comfort of the patrons. The dining area is open and spacious; it has few secluded seats. The concept is based on a balanced contrast between the angular, cold, architectural, and rugged on the one hand, and warm, cozy, matted, and soft on the other. We put two main components of the kitchen into two different environments and highlighted them with different color schemes: “gold” for fish and “silver”, grey metal, for meat. We placed the grill, the barbeque pit, and the open fish-filleting zone in the main dining area. We put the meat into a separate room with a window, resembling a laboratory. We also included a standalone chef’s table in the meat zone. The interior floor plan is rotated 45 degrees from the main axes of the building. This spatial geometry allowed us to deviate from the standard layout and look at the placement of furniture and special cooking equipment, which is the focus of this interior, from a new perspective. 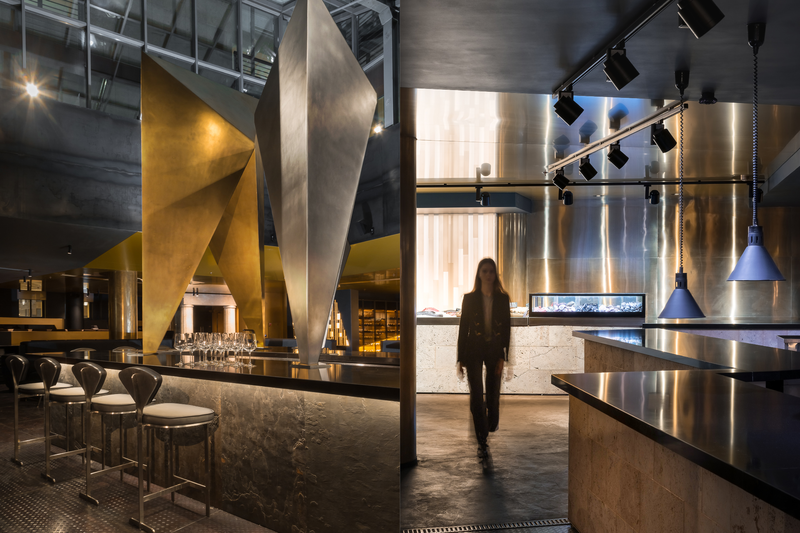 We used reflective surfaces, lots of angular geometry dictated by the shape of the layout itself, and massive architectural decorative structures in the center of the dining area above the bar. 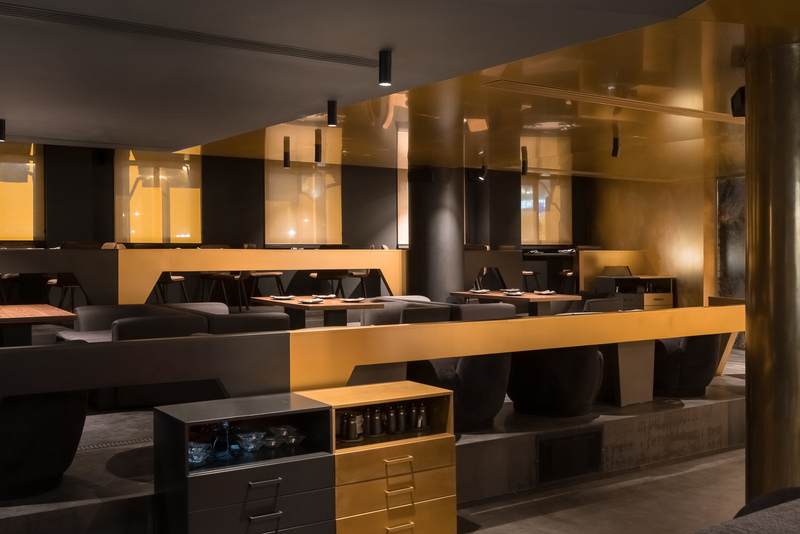 Countertops made from carbon with glossy varnish are a completely new solution for interiors in Moscow. We combined reflective elements with dark surfaces: charred wood countertops, stainless polished metal, and polished liquid metal on columns. To add more of a cozy feel, we made the second half of the interior warmer and more mysterious by using natural materials, cushioned furniture, and tables made from warm natural eucalyptus root veneer. Most of all, we used natural sand-colored limestone, thus referencing antique classical motifs. 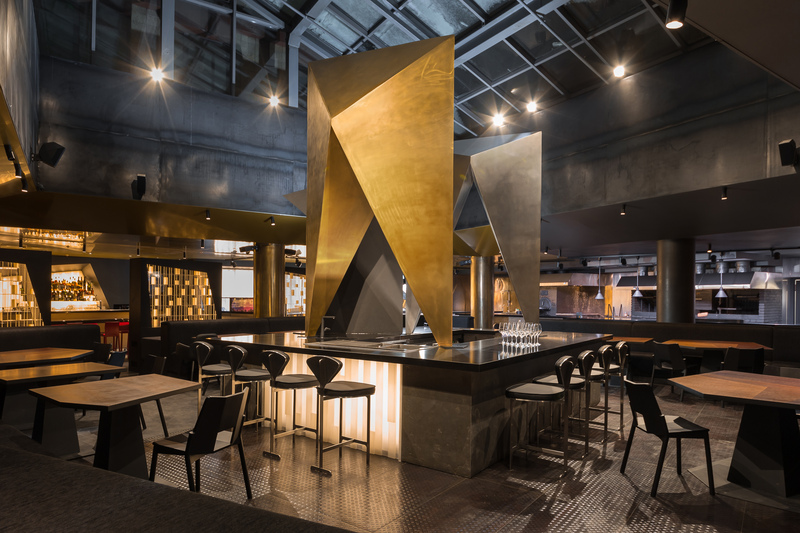 We aimed to create shapes that are commensurate with humans and to maintain well-balanced proportions, thus ensuring the comfort of the patrons. We added two VIP rooms to the floor plan. One of them is completely closed off and not visible from the main dining area. The other is part of the laboratory section and is closed off with smart glass. We were able to avoid stereotypes by adding a theatrical flair to the interior. We placed stelae that resemble stage sets in the center of the room. 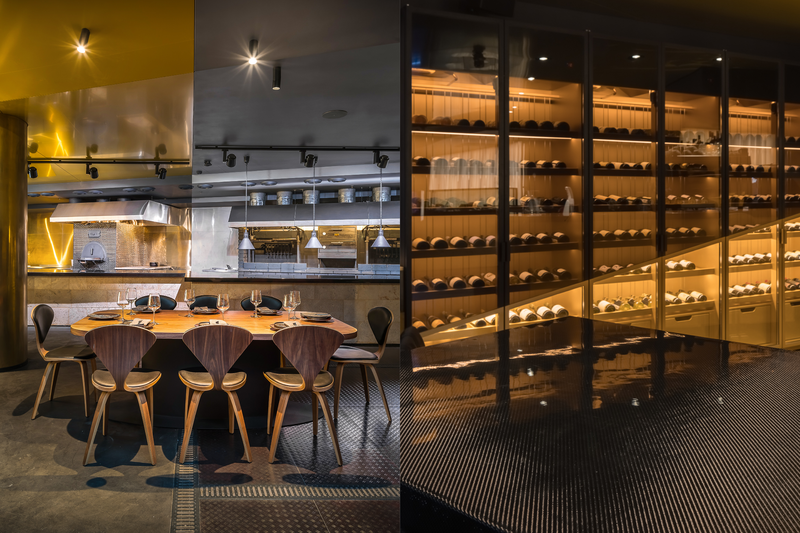 We took cooking techniques into account when designing the lighting solutions, and we used a special lighting spectrum for fish and meat. The warm light is reflected in the rugged minimalist surfaces, which creates a balance between minimalist and cozy.